Matthew Scudder returns to the screen in the person of Liam Neeson. Scudder, a creation of mystery writer Lawrence Block is a recovering alcoholic Scudder works as an unlicensed private investigator who does favor for friends. Scudder is haunted by his past and his past misdeeds which left many people dead. 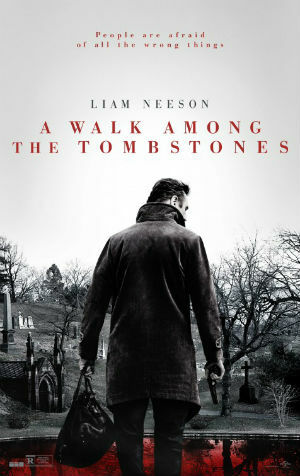 In WALK AMONG THE TOMBSTONES Scudder gets involved with tracking down serial killing kidnappers who take the loved ones of drug dealers and kill them despite promising to return them after a ransom is paid. He is put on the trail of the villains when a friend asks the PI to meet with his brother whose wife has gone missing-and turned up dead. Scudder first came to the big screen in the odd 8 MILLION WAYS TO DIE where he was played by Jeff Bridges. It was a film that kind of went no where and died before any other films could be made. The trouble is that to get Scudder right you have to have a vulnerable yet strong hero who is deeply bothered by the things that he's done. To make him be what he is in the books you have to have a sense that there is stuff going on behind the eyes of the character. Bridges never really achieved it and while the film wasn't bad, it wasn't the book in part because it stripped away the grittiness for 1980's flash. WALK is gritty. Set in the back alleys of New York this is a film that lives in the dark places where the nasty people dwell, No one is a nice person, even Scudder who is capable of ugliness as we see in flashes of his past. Liam Neeson is a near perfect Scudder. Lawrence Block has said that he like Neeson's performance and there is something about it that makes it one of the great screen detectives. Though even he would agree that he solves the crime not so much by detection but dogged determination and a ton of blind luck. I love that we can feel the weight of the world on his shoulders and see the pain lingering behind his eyes. I was hooked by the mystery and had to see how it all unraveled. This to me was and is one of the better American mysteries of the last few years. Certainly it great to see a film that brings back a private eye to the big screen.